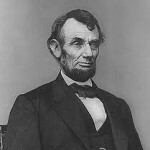 Nov.6,1860.. ABRAHAM LINCOLN is elected the 16th President of the United States. Before his inauguration, seven states will secede. Dec.2,1860…South Carolina, a strong supporter of “states rights” as well as slavery secedes from the Union. Only the first, to be followed within weeks by 6 more.. Mississippi (1/9/61), Florida (1/10/61) , Alabama (1/11/61), Georgia (1/19/61), Louisiana (1/26/61) and Texas (2/1/61). February 9,1861..the seceded southern states form the Confederation appointing former Federal army officer Jefferson Davis of Kentucky as their President. 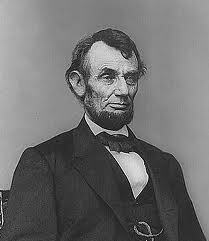 March 4,1861… President elect Abraham Lincoln takes the oath as the 16th President of the United States. March 28,1861…Federal Commander Winfield Scott, the hero of the Niagara in the war of 1812 promotes Robert E.Lee to Colonel. Meanwhile, Lee ignored an offer of command from the CSA. Scott was a hero in the Mexican-American and the Indian Wars also. But he is old and unwell. Scott is 74 years in 1861..and will offer the command of the Union army to Lee on April 17. April 12,1861…“Capture of Fort Sumter”. True start of the Civil War as Ft. Sumter is shelled at 4:30 a.m. surrendered approx. 36 hours later. April 15,1861… President Lincoln orders a “Special Session” of Congress for Independence Day, July 4. He releases an order calling up 75,000 militia. April 17,1861… Virginia secedes from the Union followed by Arkansas (5/6/61), N.Carolina (5/20/61), Tennessee (6/8/61). April 19,1861… President Lincoln orders the “blockade of southern ports”. Supplies for both citizens and war South will now be decreased for the duration of the war. “Blockade running” with fast ships will significantly aid the South in the first years only. April 23,1861… Robert E.Lee accepts command of Virginia State forces. This is accepted only after Lee turns down the offer from the Union on April 17th to command Federal forces in and around Washington. He refused..and resigned his commission in the Union army on April 20th. He had contemplated the Confederate offer for 2 days after his resignation. June 20,1861… West Virginia breaks from Virginia as it votes to stay in the Union along with Delaware,Maryland,Missouri and Kentucky even though they are slave states. July 4,1861… Congress votes and puts out the call for 500,000 men. Lincoln delivers one of his simple and stirring speeches. July 21,1861…“FIRST BATTLE OF BULL RUN”. First blood at Manassas,Va. as Federals are routed in “The Great Skedaddle”. Civilians actually came out to watch the battle with picnic baskets but are appalled at the carnage. July 27,1861… President Lincoln replaces McDowell with George B.McClellen as Commander of the Army of the Potomac. September 11,1861…the unauthorized proclamation of emancipation in Missouri by General John C. Fremont is rebuked and revoked by President Lincoln. November 8,1861…The Union Navy stops 2 Confederate diplomats sailing for England. The British government demands their release. Lincoln states “one war at a time” and ends a diplomatic standoff by releasing them.